Black? White! Day? Night! 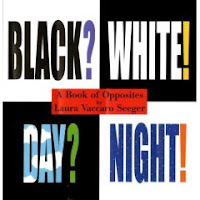 A Book of Opposites by Laura Vaccaro Seeger. Library copy. Picture Book. The Plot: It's a book of opposites; first black, then white. The twist: die cut pages with flaps. Lift the flap, and what you think is day really is night. The Good: I love that this is not only a book of opposites, it's a book about perspectives. I think my favorite was how an ant (tiny) turns out to be the eye of an elephant (huge). Also good: with the lift the flap architecture, this is a great example of inventive designs for picture books. The author has a preview at her website of black (bat) turning to white (ghost, with the bat the ghost's mouth). What the lift the flap does: lift the flap to see what you think is a bat, turn the page to see the ghost. Another good: a great guessing game; and I think it would be fun to run a program with kids to see if they could design similar "opposites" themselves. Links: Blog From The Windowsill review.